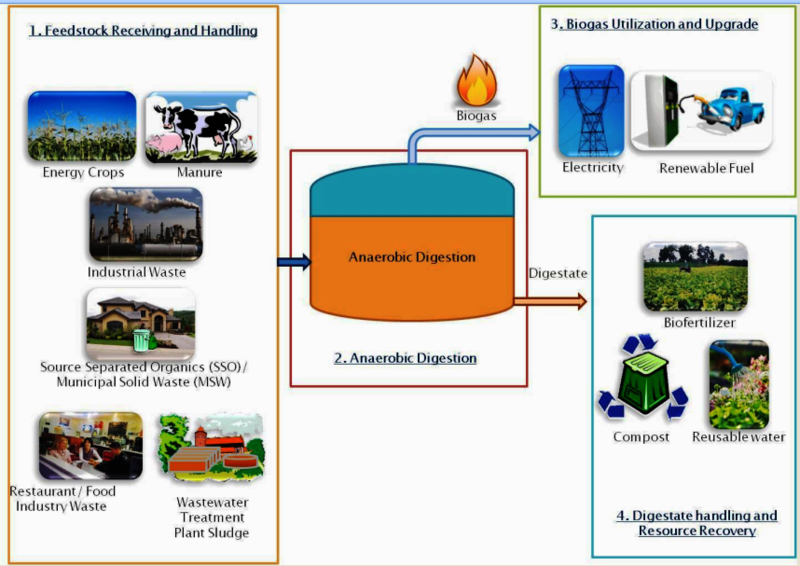 In Anaerobic Digestion (AD) technology, anaerobic process mechanisms and naturally occurring anaerobic microorganisms are utilized to treat organic wastes (like manure, sewage sludge, food waste or other biodegradable wastes). In the engineered process, an optimum environment is created for various microorganisms to break down different organic materials in the absence of oxygen. In general, anaerobic digestion is designed in an enclosed vessel known as anaerobic digester. The process can be performed with or without mixing and either in batch, semi-continuous or continuous mode. The main product of anaerobic digestion is biogas, which is an alternative and renewable energy. Biogas typically consists of 60% of methane and 40% of carbon dioxide. It also contains trace amount of other gases like nitrogen, hydrogen and hydrogen sulphide. The effluent of digester, known as digestate is a combination of residual solids and water. Further resources can be recovered from digestate or its fractions (fibre and liquor) and can be utilized as compost or fertilizer. Go to Why Anaerobic Digestion?